Sagittarius is traditionally associated with Temperance, which is the thirteenth Major Arcana in most tarot decks. In the Rider Waite Tarot this trump depicts a winged angel standing with one foot on land and the other in water, while pouring a liquid from one cup to another. The two cups are not in a parallel position, and their easy flow, which defies the ordinary law of gravity, is the result of the angel’s gentle focus attention. The cup held in the left hand pours water into the cup of the right hand, shifting the traditional roles of polarity, with the right hand here becoming receptive and feminine, and the left taking on the active and male role. Temperance operates as a bridge between opposite polarities by enhancing mobility and the capacity to alternate their sphere of influence, whereby nothing remains stuck and the web of life keeps flowing. Sagittarius is a mutable sign, and every mutable sign is preceded by a fixed sign, which in this case is Scorpio. Fixed signs exalt the nature of one specific side, which they lead to its climax, allowing it to be firm and permanent. This is the apex of the stage of identification, which is then followed by the phase of connection of that identified part with other parts that also need to be identified, in the process of retrieval. Being on a healing path implies setting an intent and giving it concrete and fixed form, and then surrender it to the web of life, connecting that form to other forms until the integrity of the circle is fully re-awakened. Temperance represents the fusion, integration and mixture of dissimilar elements aimed at achieving a harmonious balance and synergy. This principle is represented by the rainbow, associated with the Sagittarian archer, consisting of seven colours representing the visible planets of the solar system. In Hindu myths the rainbow, is the bow of Indra, the god of thunder, lightning and storms (associated with Jupiter, ruler of Sagittarius), while in Greek mythology it is the path created by the goddess Iris, who is the angel depicted in the card, in order to connect Heaven and Earth. Iris, similarly to Mercury, is the messenger of the Olympian gods and also carries a caduceus. She travels to the underworld to fill her golden cup with water from the river Styx, with which she puts to sleep those who perjure themselves. Although the shining sun and the radiance of the angel provide abundant luminosity, Temperance is definitely a card of the underworld and, given its association with Sagittarius’ last stage of autumn, represents indeed the climax of darkness. Temperance is one of the cardinal virtues enumerated by classical Greek philosophers and the Christian tradition, together with prudence, justice and fortitude. The Greek term for “temperance” is sophrosune, which means moderation, self-control, soundness of mind, and the harmonious balance of the soul. This was regarded as the most important of all human virtues, the model for the maximum expression of life, encompassing a fulfilment both in the inner and outer world. Applying this virtue of moderation often entails being able to stand in the midst of extreme opposites, which also implies, according to circumstances, learning when to move more towards one than the other. The reference to moderation was also found in the inscription of the Temple of Apollo at Delphi, where the widely renowned maxim “Know Thyself” was preceded by the less known dictum “Nothing Too Much”, i.e. “Nothing Too Much and Know Thyself”, which placed the art of moderation as a priority in order to know oneself. For a video on the mystery of the missing virtue of sophrosune click here. The seeker who has travelled many times through the sacred circle, deeply exploring all aspects of life represented by the zodiac signs, and learning their lessons, besides becoming a master in moderation, acquires the capacity to combine the different features of life in a synthesis rather as separate compartments. 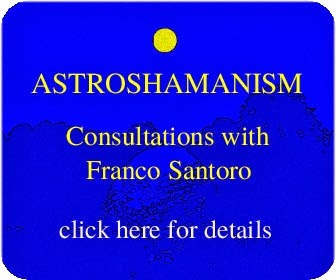 This involves being experientially aware of the simultaneous dynamics of the Sun and the Moon, so that, for example, during the dark late autumn cycle, when the Sun is in Sagittarius, he can also encompass the bright summer cycle and all the other seasons as the Moon transits them all in its lunation. Typical signs of lack of temperance are the incapacity to integrate business with private life, serious things with laughter, love with sexual attraction, friendship with money matters, etc. This results in experiencing life as a series of disconnecting roles, devoid of any association, and shifting periodically, without any possibility of assimilation. 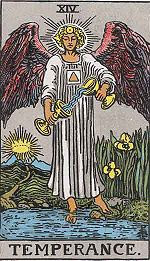 Temperance involves the integration of all elements in life, which may also imply making specific choices or following a given direction, yet while still holding the connection with all the others. It is an exemplification of the Middle Way, the Buddhist Noble Eightfold Path, “the way that leads to the extinction of suffering, namely: right understanding, right thought, right speech, right bodily action, right livelihood, right effort, right mindfulness, and right concentration" (Samyutta Nikáya. LVI, 11). In divination Temperance may indicate an invitation to operate with integrity and maturity in dealing with a certain matter, which may at times also involve doing nothing. Hence in a reading Temperance can simply tell you to take it easy, be patient and not carry things too far. Another indication from this trump is to expand your perception and open yourself more regarding the implications of any matter relevant to you. It may also suggest the need of letting go and applying true forgiveness in a situation where action is primarily motivated by fear, competition and subtle resentment. Hence when Temperance emerges in one’s life, this is an invitation to pause and be available to delve into the profound aspects of our nature, challenging the assumptions of our ordinary identity, and of all we take for granted in our perception of others and the world. Temperance calls for a perspective that allows all aspects of life to be acknowledged and honoured, bringing benefits to both apparent polar opposites and reconciling them in a meaningful and profound way.